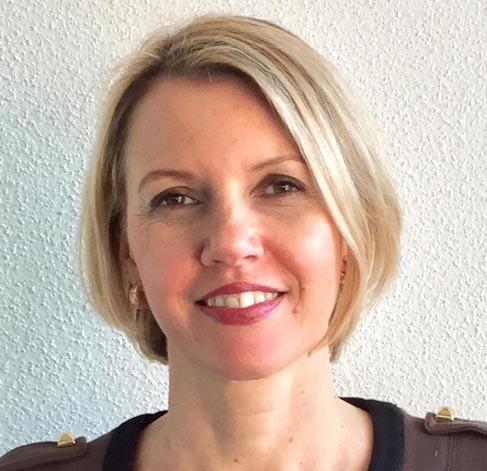 DelfMEMS has announced that its world leading, twelve throw, RF-MEMS ohmic contact switch design has just passed the one billion test cycles milestone and is still going strong. There are key two innovations by DelfMEMS that help it achieve this breakthrough. First, although gold is currently used as the contact material, this will be replaced in the production switches by a metal compound that has been proven to be reliable for cold switching in excess of 50 billion cycles. Second, its patented FreeFlexTM MEMS switch design ensures that the contact point is always changing slightly, which lengthens the life of the switch. 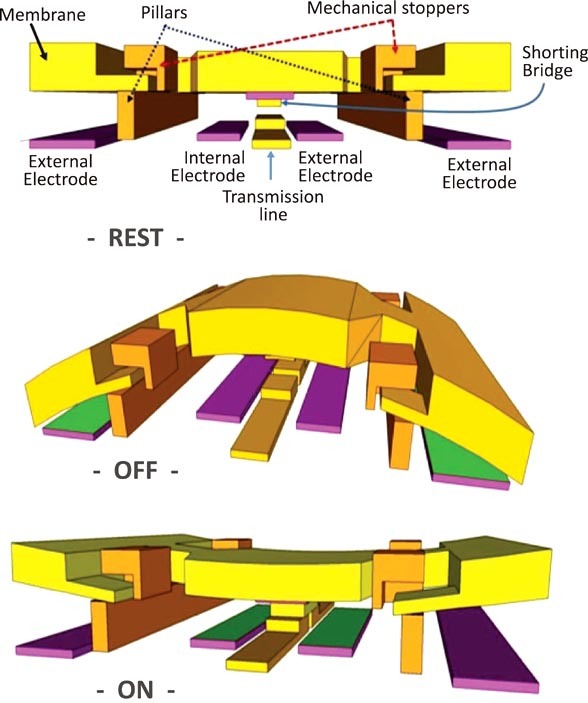 The DelfMEMS RF-MEMS switch structure uses a new, integrated, micro-mechanical building block that is based on a robust, new IP portfolio that includes seven key patents and innovations. It does not use a cantilever beam or bridge featuring a highly conductive electrode electrostatically actuated in order to create an ohmic contact resulting in a mechanical switching. These older structures proved to have several issues: stress on the anchors, possible stiction, low commutation speed and possible creep of the beam. 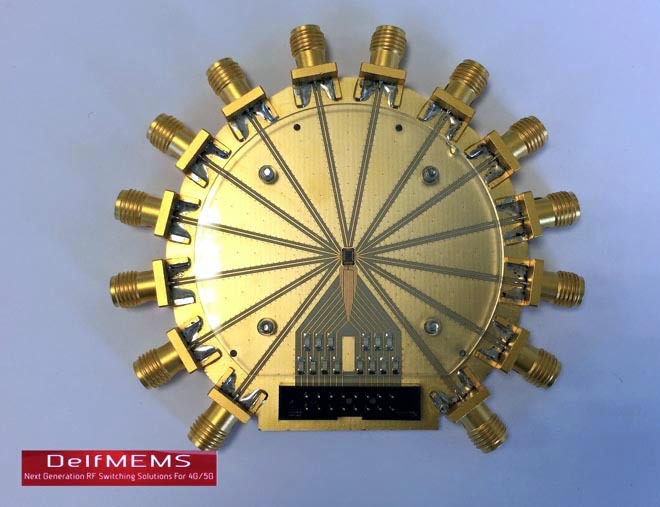 DelfMEMS innovative design approach has resulted in the development of an anchorless structure for mechanical RF switching which totally overcomes these historical design problems instead of trying to simply reduce them. The FreeFlex membrane is always in a known controlled state as it is electrostatically actuated by two sets of electrodes. The electrostatically ON state is achieved by making physical contact between the membrane contact area and the transmission line and the similarly controlled OFF state is achieved by keeping a physical distance between the membrane contact area and the transmission line. This means that the switch contact area will either be attracted to the conductive line or repelled from it. Moving from ON state to OFF state is made through an electrostatic active actuation, which de- couples between restoring forces, contact forces and the membrane mechanical properties. 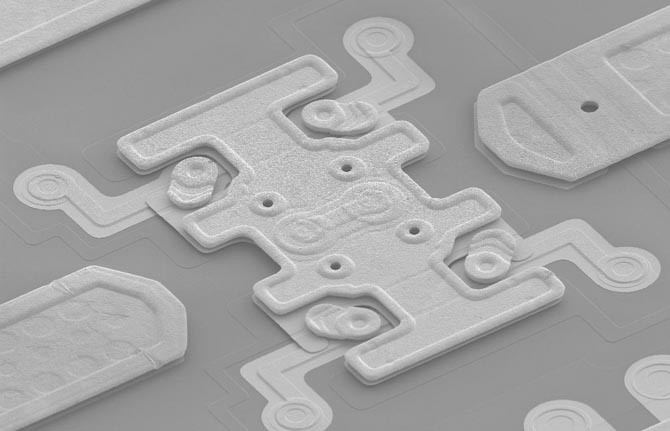 Another strong advantage of FreeFlex switch structure is the possibility to have a reduced gap between the membrane and the transmission line, which will reduce the creep and mechanical stress by lowering the maximum deflection of the membrane. This results in an increased contact force in ON-state with lowered actuation voltage and therefore lower insertion losses. DelfMEMS RF-MEMS switches are surface micro-machined devices that use a mechanical movement to switch the RF transmission line on or off. This technology doesn’t suffer from frequency dependency and high multi-throw switch configuration limitation. With a Figure of Merit <10 it offers dramatically superior linearity, insertion loss and isolation performance compared to existing solid-state solutions. This first generation of DelfMEMS switches are manufactured by Honeywell / Tronics in Dallas, Texas and will complete qualification by the end of 2015.